A.T. Ellison, An Overview of Childhood and Adolescent ADHD: Understanding the Complexities of Development ino the Adult Years. S. Goldstein, Continuity of ADHD in Adulthood: Hypothesis and Theory Meet Reality. R. Barkley and M. Gordon, Research on Comorbidity, Adaptive Functioning, and Cognitive Impairments in Adults with ADHD: Implications for a Clinical Practice. D.E. Johnson and C.K. Conners, The Assessment Process: Conditions and Comorbidities. K. Murphy, Clinical Case Studies. K.G. 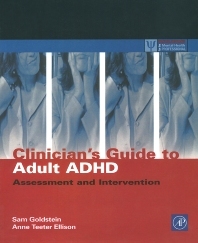 Nadeau, The Clinician's Role in the Treatment of ADHD. R.B. Brooks, Changing the Mindset of Adults with ADHD: Strategies for Fostering Hope, Optimism, and Resilience. S. Young, A Model of Psychotherapy for Adults with ADHD. J.B. Prince and T.E. Wilens, Pharmacotherapy of Adult ADHD. R. Crawford and V. Crawford, Career Impact: Finding the Key to Issues Facing Adults with ADHD. P.S. Latham and P.H. Latham, What Clinicians Need to Know About Legal Issues Relative to ADHD. P. Kilcarr, Making Marriages Work for Individuals with ADHD. T.W. Phelan, Families and ADHD. N. Ratey, Life Coaching for Adult ADHD. A.L. Robin, Lifestyle Issues. Index. This text offers practicing clinicians strategies, interventions, suggestions, guidance and ideas to work with adults struggling with Attention Deficit Hyperactivity Disorder, and is intended as a reference to which clinicians will turn time and time again as issues or problems present themselves. The text will also provide a comprehensive review of the scientific literature and expand the development of an ongoing model to treat Attention Deficit Hyperactivity Disorder. Clinical psychologists, psychiatrists, clinical social workers, adult education specialists, college counselors. Neurology, Learning and Behavior Center, University of Utah, Salt Lake City, U.S.A.
University of Wisconsin, Milwaukee, U.S.A.